World Earth Day is April 22nd and we want to help make it S'well! Here at Lavish & Lime we've teamed up with our friends at S'well – makers of the popular S'well stainless steel water bottle (one of Oprah's favourite things) – and have five S'well bottles to give away to five lucky earth conscious winners in our Earth Day Giveaway. Did you know 88% of plastic water bottles are not recycled? Those that are take up to 1,000 years to biodegrade and may leak toxic additives into the groundwater. Plastic bottles are becoming the fastest-growing form of municipal solid waste in Canada and the U.S.* This Earth Day and every day, we want to help you help the earth and reduce the use of plastic water bottles. Tell us what other litterless lunch item you'd choose for a waste-free pairing and one of our double walled, stainless steel, ergonomically designed and ultra sleek S'well bottles could be yours! Tell us what other item from our waste-free lunch gear collection you'd pair up with a S'well – and you could win a S'well Water Bottle in the colour of your choice. Choose from green, pink, blue, red, silver, yellow or black, as stock availability allows. You can browse all of our Lavish & Lime waste-free lunch gear here. The winner will be chosen in a random draw. Deadline for entries is 11:59pm PST Monday, April 30th, the giveaway closing date. The winner will be notified by email Tuesday, May 1st. Open to residents of both Canada and the U.S. who are over the age of majority in their province, territory or state of residence. Prize must be accepted as awarded and may not be transferred or exchanged. It is not redeemable for cash and is non-refundable. I love the snack bags! I love the Glass Food Storage Container Sandwich Cubes! I would pair it up with the stainless steel straws!! I like the stainless steel containers! A Grover reusable bag-with a lavish lime bottle. Liked the page & commented. I like the glass containers! Love the bottle, and really really love the double Tiffin Box! liked Green S'well Bottle product page! I would definitely pair the S'well bottle with a reusable lunchbag. Currently I carry a bag representing a non-existent WNBA team. The Stainless Steel Food Container would go very well. I'd pair it with the stainless steel food storage containers. 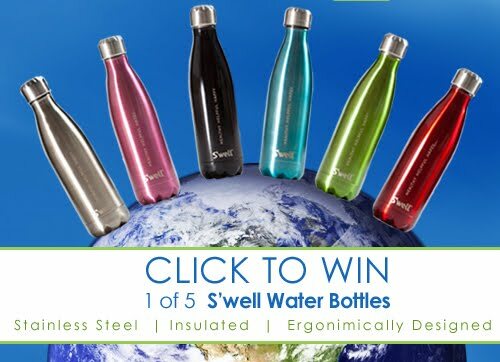 I love the look of the S'well bottles! Well duh the reusable bag not just to hold my lunch but to carry me reusable bottle without people thinking I am drunk but will be a reconzied eco friendly guy. I love the Keep Leaf reusable pouches for snacks and sandwiches. You'll never have to throw away another zip lock baggy. I would love to pair it with the reusable kids lunch bags (owl, kitty & puppy). So cute~! I would like some of the Glass Food Storage Containers. I'd pair it with the rectangular Leak Proof Stainless Steel container. Love the stainless steel straws!! I like the Packit Lunch Coolers. I would definitely use "clear snack packs". Awesome for my kids when we day hike. I love the reusable sandwich wraps! I'd pair it with the Stainless Steel Food Container - medium lunchbots quad blue! Sandwich guard and fruit guard - so I can pack my 2 year old daughter's dinner "picnic" - watching the ducks and boats on the Potomac. I'd pair of Swell with Reusable Sandwich Wrap. I like the wean cubes, round glass-steel container, and the RuMe bags! The reusable sandwich wrap with the S'well bottle would pair up great for work lunches. I think that the bottle would be swell with a medium stainless steel lunch container. the keep leaf reusable snack bags!!!! we have them and love them!!! I would love to use the keep leaf reusable snack bags! I like the leakproof stainless steel containers. 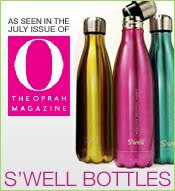 And I love the Swell bottles! i would like to pair it with lunchbots! Would love a S'well Bottle. Would pair it with a neoprene lunch bag. I'd pair it with the Big Apple Buddy Cornelia Kitty Lunch Tote. I'd pair it with either a large LunchBots stainless steel container or the Konserve Stainless Steel Nesting Containers Trio. Definitely the stainless steel cutlery! I love the glass containers! I'd pair it with the Snack Flap Duo Snack Pouch. I would pair this water bottle with the Glass Food Storage Containers Snack Cubes - 2-pack. Definitely the stainless steel lunch containers! I am looking for a way to go zero waste for my school lunches! I would pair that RuMe Metro Baggie Collection with the lime green S'well bottle. They would look so chic together on a lunch break. I like the Glass Food Storage Container Sandwich. Yellow's missing! I so want a neoprene lunch bag to match the pink bottle!!! Yellow is missing. I'd pair it with a reusable lunch bag. I would pair them with the glass storage containers for lunch. How awesome to possibly win one of Oprah's favourite things! Like, follow and e-mail. I like the Glass Food Storage Container Sandwich Cubes. I WOULD PAIR EITHER THE STAINLESS OR BAMBOO CUTLERY,I CAN'T DECIDE WHICH.